You can listen to 'Sleep alone' here. 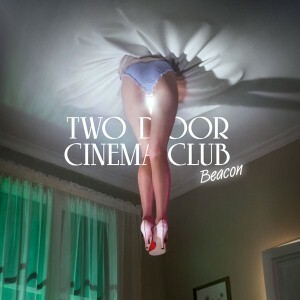 Beacon by Two Door Cinema Club is being pushed heavily on Dutch national radio. I honestly wondered why as I was through quite fast with the band's previous effort, 'Tourist history'. Nothing stuck, so I discarded the album. Listening to Beacon I decided to listen again and give it a try. Yes, it's commercial and there are some dance influences and clearly Keane's no stranger to these boys from Northern Ireland. So they potentially know what it takes to come up with a song that implants itself in your head. (Although for Keane it's been a while since that happened to me. That be 'Crystal ball' and not even that was very welcome.) Like the two big hits from EMF circa 1992, "Ooowh", although the major oommpphh 'Unbelievable' offered is totally missing on Beacon. Beacon aims at pleasing, but does it succeed in pleasing me? The album is basically one dimensional, mostly because of the voice of Alex Trimble, who sings in one way only, but also in sound. The first three songs are quite enjoyable. The guitar leads in 'Wake up' are U2esque, but well placed, making the song come alive. So I'm past the first few songs. This gives the whole album a chance to grow. In a different setting I would not have liked the voice, like I can't listen too long to Bon Iver or Fleet Foxes. With this music it's better digestible for me. Beacon contains pop. Some songs bring Pet Shop Boys (played with guitars) to mind. Lightly arranged songs that are aimed at people at least a generation younger than I am, but that doesn't hold me back. In the end it's the lack of adventure that stopped me from investing more time in the album. The way I'm put off by The Killers after a few songs into an album. 'Sun' is a kind of obligatory dance pop tune that turn me off completely. A few other slower songs, like 'Spring', don't convince me either. All in all Beacon doesn't come alive for me. Although I do hear quite well where the potential of the band lies. Some songs come close to the kind of songs that I do like, e.g. single 'Sleep alone' and 'Someday', but something is missing, that I can not really put my finger on. Perhaps it's not really letting go when the fun should be on and TDCC or more precisely Trimble's voice holds back, Editors style? It may not be more than a small detail. Maybe next time?